There is huge demand for H-1B visas this year, a reflection of improved US economy and of the desperation of IT outsourcing companies including Indian IT companies who are the largest users of H-1B visas to capture great number of these visas. The US Citizenship and Immigration Services (USCIS) has said that it had received a total of 1,72,000 H-1B visa petitions when it was open for accepting. This compared to last year 1,24,000 received petitions, shows an increase of 40% H-1B visa petitions this year. Currently US economy is extremely doing well. There is an increased demand for outsourcing in the last two years as well, and this year outsourcing firms have tried their best to file enough H-1B visas and fulfill orders. 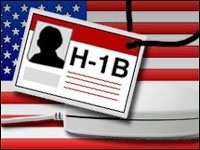 US H-1B visa is a non-immigrant visa which allows US employers to employ foreign nationals. However, the Congressional mandated cap is 65,000, with additional quota of 20,000 for those with higher degrees. As petitions exceed the quota, US Citizenship and Immigration Services will conduct lottery system to select the candidates. The more H-1B visa petition filed by a company, the greater the chances of getting visas. The petitions for advanced higher degree quota did not receive the cap of 20,000. Indian IT firms will also make use of the option L-1B work visa, but these are meant for those with more specialized knowledge than that of H-1B.